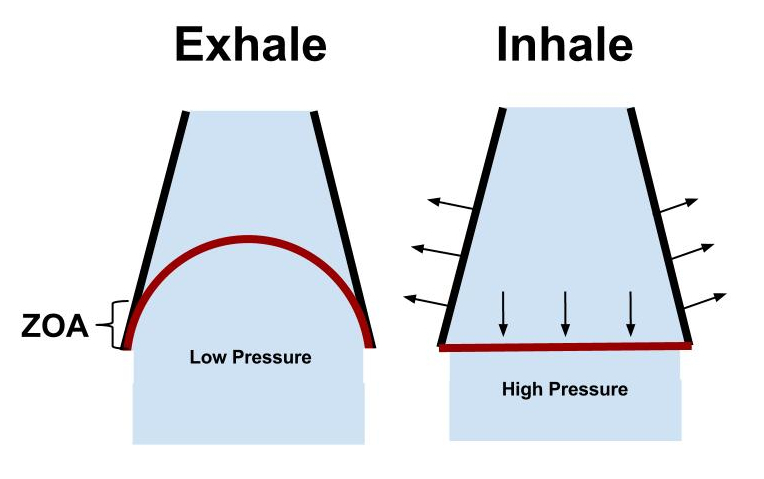 This post will discuss the holistic effects of breathing, anatomy, and the important cascade of events for proper breathing and inner core stabilization. Because everyone is doing it. 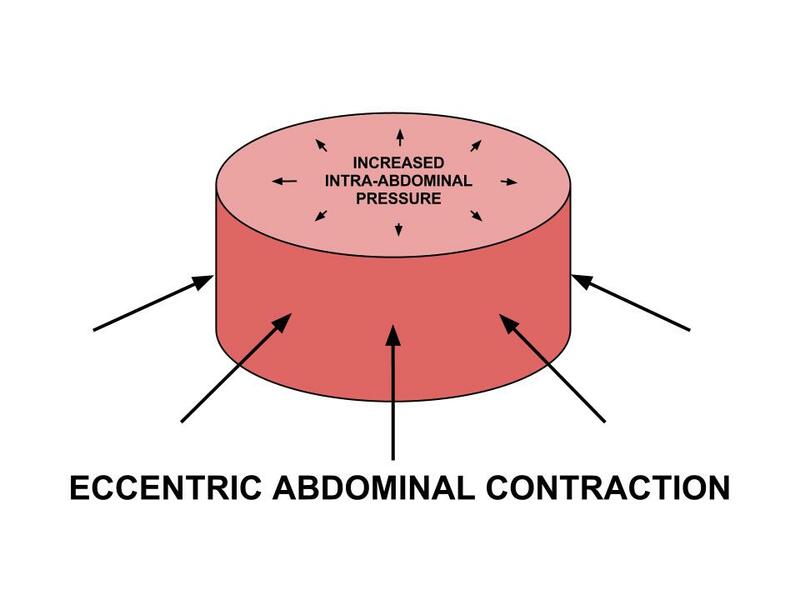 Power lifters have been controlling their intra-abdominal pressure to lift massive weights for years. Yoga and eastern medicine have been using breathing for over 2,000 years (PT isn’t even a century old) . Gray Cook and the SFMA require a full breath at the end-range of every movement test to achieve a FN. The neuro-orthopedic approach leans on breathing and even mentions that a deep breath glides the median nerve 1 inch. There is an increasing amount of approaches that are including breathing (PRI, SFMA, DNS). Many of the leading experts in the field are incorporating breathing. And there is more and more research coming out discussing the benefits of breathing. So if you’re not doing it, or at least aware of it, then you are probably that guy. Breathing has a huge influence on the entire body. Breathing influences sympatho-vagal balance. Dyfunctional breathing can induce hypocapnia (effect of hyperventilation). Hypocapnia causes increased neural activity and synaptic transmission. You know those patients that feel that every muscle is tight and you can never decrease their muscle tone for more than 24 hours? Maybe it’s because of their breathing. Breathing can actually produce an amplification of the parasympathetic nervous system. This can have a tremendous effect on muscle tone (a nervous system issue). Breathing also has a significant role in the circulatory system, pH regulation, and metabolism. It has been tied to many psychological disorders and can have a major effect on self-regulation of stress and emotion. Breathing even has an important role in some religions and spiritual practices. Breathing has a therapeutic, homeostatic, regulatory, psychophysiological, and spiritual function. If your patients are alive, then breathing should be considered as an aspect of their care. A global understanding of breathing anatomy can be expanded from knowledge of the deep front line. This line from Anatomy Trains goes into the fascial attachments of the diaphragm in great detail. Or simply stated, “the 12th rib is where walking meets breathing“-Tom Myers. 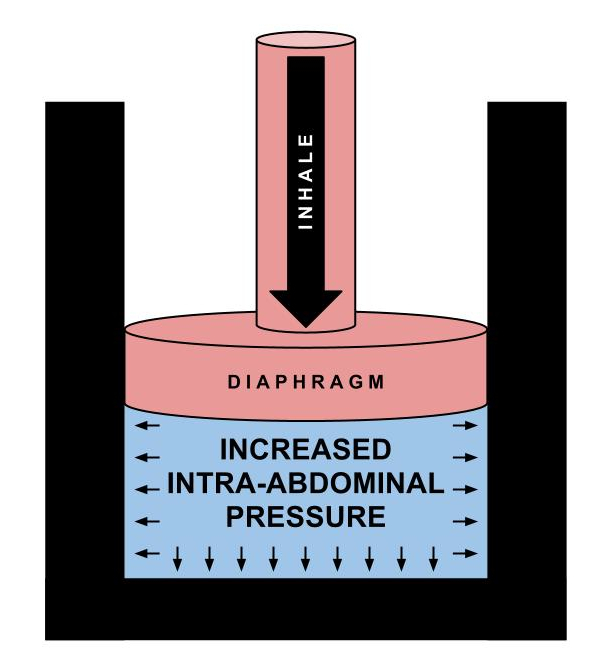 The diaphragm has a dual function: respiration and stability. It should be able to perform this dual function at all times. 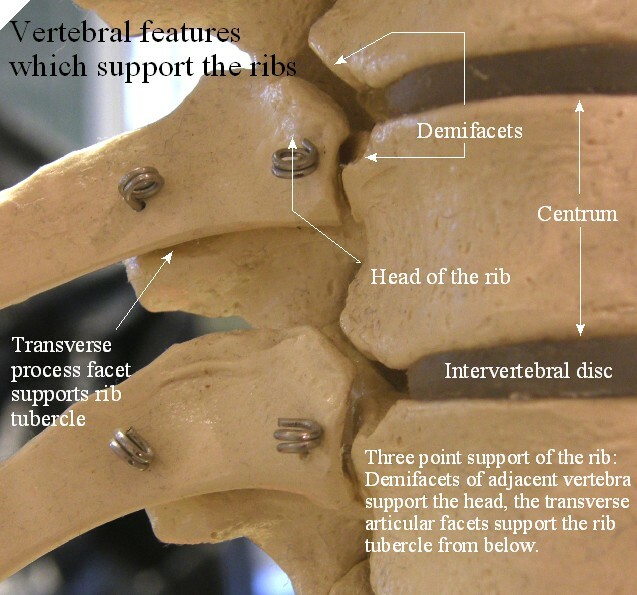 A common injury is caused by a failure of this mechanism. The overweight, sedentary, desk-jockey wakes up to shovel snow out of his driveway. After 5 minutes he’s exhausted and his diaphragm has to devote all of its power for respiration. Now his diaphragm has lost it’s stability function. Now he can’t control and use his intra-abdominal pressure (IAP). And now he just hurt his back. 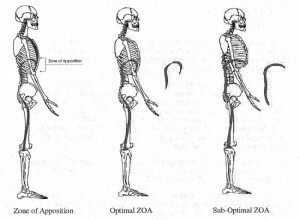 Overall the ZOA is paramount for proper diaphragm function. Some have found it to be as much as 30% of the inner surface of the ribcage. A decreased ZOA will result in inefficient diaphragm contraction, lung hyperinflation, increased accessory muscle use, lack of postero-lateral movement of the rib cage, and an increased anterior rib flare. The abdominals and pelvic floor play a huge role in inspiration (eccentrically) and expiration (concentrically). 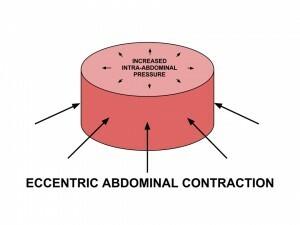 During inspiration they contract eccentrically to increase the intra-abdominal pressure (i.e. 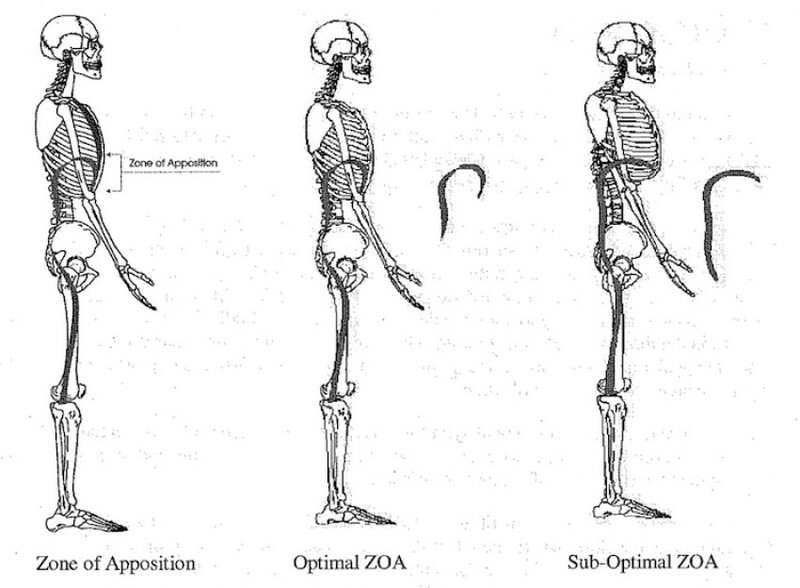 stability) and ensure that the ZOA is maintained long enough to produce postero-lateral expansion of the lower ribcage. During expiration they concentrically contract to help push the diaphragm cephallically, thus restoring optimal ZOA. The thoracic cavity is where the actual breath occurs. It’s where the air molecules and gas exchange occurs. The thoracic cavity must have the appropriate amount of mobility to accommodate this pressure change and flow of molecules. During inspiration the ribs must be able to ER and the spine must be able to extend. During expiration the ribs must be able to IR and the spine must be able to flex. Breathing plays a major role in the hydration of the thoracic discs. If you look at the anatomy of the ribs attachment to the thoracic spine it almost looks like a lever. This lever actually pry’s open the thoracic spine and elongates it, thus bringing hydration and nutrition to the discs. There is a cascade of events that leads to controlled intra-abdominal pressure through the activation of the diaphragm and core musculature. By using the breath with the core you are achieving natural muscle activation and increased intra-abdominal pressure. This pressurized stability is much more efficient than muscle activation alone (abdominal hallowing/isolated TVA activation). The best way to have a proper breathing pattern is to get it right from the inhale. 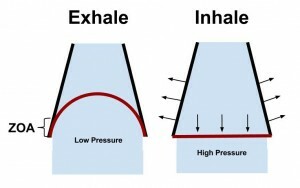 A proper inhale will put you in the correct position for a proper exhale. Clinically there are many things that can go wrong with inspiration, whereas the only thing that often goes wrong with expiration is decreased expired air (hyperventilation/decreased ZOA). The inhale is the initiation of core stability. 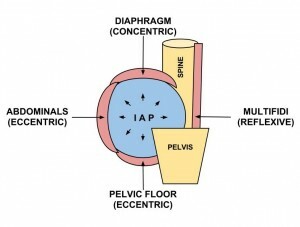 Increased IAP is optimized with an eccentric contraction of the abdominals & PF. This maintains ZOA and causes 3-dimensional expansion of the lower ribcage. The effect of a proper inhale results in controlled IAP via trunk musculature. The increased IAP anterior to the spine causes a reflexive activation of the posterior spinal stabilizers. Understanding breathing anatomy and mechanics will allow you to easily assess and intervene respiration. The effects of proper breathing are: adequate respiration, proper biochemical balance, decreased/prevention of psychological distress, and most important for physical therapist – natural activation of the inner core stability. Part II will deal with ideal & dysfunctional breathing patterns, assessment, and some simple interventions.